Pretty. What a good husband. 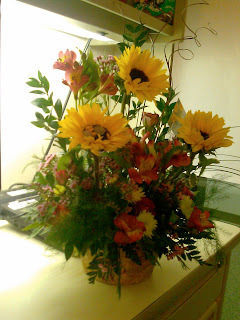 Great job Cary, the flowers are beautiful that was so thoughtful of you to think ahead for Aly. Hope you are doing well. Love reading Aly's blog about you and her too of course. Keep safe!!!! Thanks, Mom! I'll be sure to give Cary your props; he still doesn't have Internet! Arggh. love the flowers! good job cary. we missed you guys tonight. i was thinking about you both and wishing you could be here for dinner tonight! we went to beaches... you both came up several times during conversation... i think we should visit sometime soon! We miss you too! Well, especially me. =) Aw, thanks for thinking of us. Wish we could have been there, I love beaches!